This album has the unique distinction of having been released in the US under two different titles: "Sit Down Young Stranger," and - a bit more than a year later - "If You Could Read My Mind." There is no difference between these two albums; only the album title on the cover is different. The LP title was changed to capitalize on the radio and chart success of the song, "If You Could Read My Mind." When the album was first released on CD, the popular title was used, but there was a later second CD reissue which used the original title. For fans across the pond, the title song was used on the UK TV series, Trigger Happy TV, as the theme for the portrait artist. It was not on any of the TV series soundtrack albums. Lightfoot toured the UK and Ireland in 2016, for the first time in 35 years! See more buying options below. The "If You Could Read My Mind" album was released by Friday Music on 180 gram, audiophile vinyl on February 19th. It is available from Amazon.com now: If You Could Read My Mind audiophile vinyl LP from Amazon: US CA UK. This release of If You Could Read My Mind follows audiophile vinyl releases of Sundown, Gord's Gold and All Live (Massey performances), as well as Record Store Day releases of Sundown and of If You Could Read My Mind under its original title, Sit Down Young Stranger. I will have two copies of the two Record Store Day releases available for sale from my store (write to me if you want one and don't see it). Because they were released only for Record Store Day, in very limited quantities and only in Canada, they are scarce and a bit more expensive. I was able to sample both of them on high end equipment, and I think they are very good; I have not been able to listen to the Friday Music releases of these four albums, but I assume they are good too, but these are different remasterings so a true audiophile might notice differences. Like the earlier albums, this release is a "Limited Edition", and will include the original artwork. The new album was mastered by Joe Reagoso from the original Reprise Records tapes at Friday Music Studios and Capitol Mastering in Hollywood. Note that the CD too was released both under its original title of Sit Down Young Stranger, from reissue label Wounded Bird, and also under the name of its hit song, If You Could Read My Mind, which Warner has used as the album title since 1971. I sell copies of the original If You Could Read My Mind album from Warner Canada, which includes the original liner notes with lyrics. If you buy elsewhere, be sure to get the Warner CD, and not the reissue. Read my review below, to learn just why this album is so great! Breakthrough Album - One Of The Best! 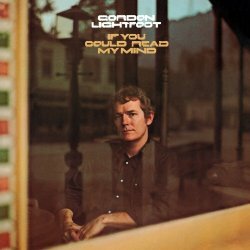 If You Could Read My Mind was the breakthrough album (and single) for Gordon Lightfoot as a singer. This was his first album since switching from United Artists to Warner Brothers and what is today the title song was his first US chart single (reached #5 on Billboard). The mix of "If You Could Read My Mind" on this album is actually different from the version on Gord's Gold. The latter is the mix used on the single that was released after the album, and as a result of the song's radio popularity. The single and the version on Gord's Gold have harmony vocals (by Lightfoot) which are not on this original album cut. Read more about If You Could Read My Mind (the song), or click here to buy the song MP3 from Amazon. The original title song, Sit Down Young Stranger, remains one of Lightfoot's most compelling topical ballads, and one of a handful of "anti-war" songs that he wrote back in the 60s and early 70s. If you've never heard this one - or especially if you have - the album is worth buying for just this one magnificent song! Other outstanding songs on the album include Minstrel Of The Dawn, Lightfoot's cover of Kris Kristofferson's Me And Bobby McGee, and The Pony Man, a favorite of children of all ages. My review title says it all: this album is one of the best!